Slice banana bread and place it on your plate. (We show, here, three slices from a mini-loaf (about 2 1/2" x 5 1/2" [6 cm x 14 cm] loaves) as a conservative, sharing portion - adjust for taste. Prepare 1 recipe of our Fast and Easy Chocolate Sauce for this entire desert (you may boost the sauce volume if using more ice cream ... or if you just need more chocolate). 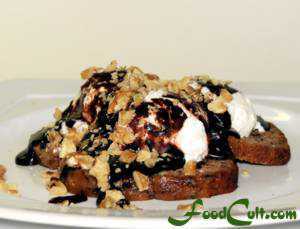 Pour chocolate sauce over ice cream - allowing it to drizzle over exposed banana bread. Top with chopped nuts - preferably of the same kind as may be baked into the banana bread. (We used, here, walnut pieces in the bread and crushed walnuts as the final topping. For Banana Bread Sundae perfection - use a chocolate chip banana bread with walnuts. Dice your Banana Bread and serve it in a sundae boat (with two spoons ... for lovers). When you've got an abundance of banana bread, an addiction to dessert, a deep appreciation for ice cream and a devout love for chocolate, well, need we really say more? When we see bananas really inexpensive, significantly reduced because they're too old for the grocer to sell at full price, we get banana bread. Typically, we'll make mini-loaves (1/4 the volume of a regular 8" [200 mm] x 4.5" [115 mm] loaf pan). We wrap up the extra loaves carefully and freeze them for later use or share them with friends and family. Sometimes we add chocolate chips for a more dessert-like loaf but they almost always have walnut or pecan pieces in them. It is these (the ones that have chocolate chips) that are best, in our opinion, for the Banana Bread Sundae. Because we make mini-loaves, we cut a few slices of banana bread. If we were preparing a full sized banana bread loaf we would likely only cut a single slice for this dish. We then lay on our favourite vanilla ice cream, and top it all off with our Quick and Easy Chocolate Sauce and walnut or pecan pieces for a delicious, satisfying desert for one or for two to share!